Located in Japan’s smallest island of Shikoku, Ehime Prefecture is a land rich in history that is often overlooked by foreign visitors to the island nation. This is partly due to the fact that Japan isn’t truly an island nation, but a nation of islands. Shikoku is one of these islands full of mystery and wonder. From the 88 temples that see thousands of Buddhist pilgrims traverse the entirety of the island by foot, to the historical tradition of fishing in the area, Shikoku is enchanting, enigmatic, and yet still easily accessible. The island is connected to Japan’s main island of Honshu by the nation’s largest cluster of bridges and tunnels, among them the Akashi Kaikyo bridge, which until very recently was the longest in the world. Although traditionally an island of fishermen, Shikoku has played a vital role in Japanese history. The very ancestors of the fishermen that sail these waters today were also fisherman who once served as de-facto sailors; defending Japan’s precious Inland Sea from pirates and Mongolian invaders. Ehime Prefecture, ancestrally known as Iyo, forms the north-western part of the island that makes up Japan’s Inland Sea, the birthplace of Japanese culture. Thus, the vital fisherman of ancient Iyo had the grand task of guarding the western inlet of the Inland Sea –without which Japan’s culture could not have remained as insular in its development. Due to its natural beauty and geography, hundreds of temples and shrines dot the island, of which Ehime prefecture has 27 of the famed 88 temple pilgrimage route, the most out of the four prefectures on the island. Ehime is also home to Shikoku’s largest city, Matsuyama, a metropolitan area of half a million people. Even the name Ehime, means ‘lovely princess’; a name which embodies the prefecture’s attractive spirit. The famed 88 temple route is a task that most Japanese embark on at some point in their lives. The route is meant to inspire awe and contemplation for individuals seeking enlightenment. The process usually involves traversing the island of Shikoku complete with stylish pilgrim garments. This includes a white Hakue, or short kimono-type jacket, a walking stick inscribed with important and contemplative teachings, and a Sugegasa, otherwise known as the traditional bamboo rice-farming and cone-shaped hat that we might be familiar with in the west through lore and film. For pilgrims on the island, Ehime prefecture, is the last on the route of the 88 temples, and is thus known as ‘bodai-no-dojo’ or the place of attainment of wisdom. Mount Ishizuchi, whose jagged peak resembles a massive stone hammer, is western Japan’s highest point at 1982m. The mountain offers stunning panoramas and forms part of the island’s 88 temple pilgrimage route (the little rock pagoda at the summit is as rewarding as any of the more richly decorated temples closer to the ground). The mountain is also known as one of Japan’s Seven Holy Mountains (or 七霊山 nana reizan), forming part of the larger Ishizuchi Kokutei Koen, a sort of quasi-national park. Located on small Mt. Katsuyama, in the center of the city, Matsuyama Castle is an immaculately preserved medieval castle that is worth a visit for its unique cultural offerings. The castle has a distinct stately appearance supported by a fortress-like base with white stucco and brown cedar elements on its upper section. Its unique structure and central location feel uniquely grounded above the hilltop setting (compared to Japan’s other castle structures, such as famed Himeji-jo, or the White Crane, which are often located on small mounts or open planes). Through its nearly impenetrable fortress and setting, the castle is unsurprisingly known as the ‘bear castle’. Matsuyama Castle is accessible by cable car from the eastern edge of the mountain, or through a steep hike to the summit. On the way down, a stop at Ninomaru Shiseki Tei-en, on the outer citadel of the fort, is worth a visit with its old Japanese style gardens and water features. 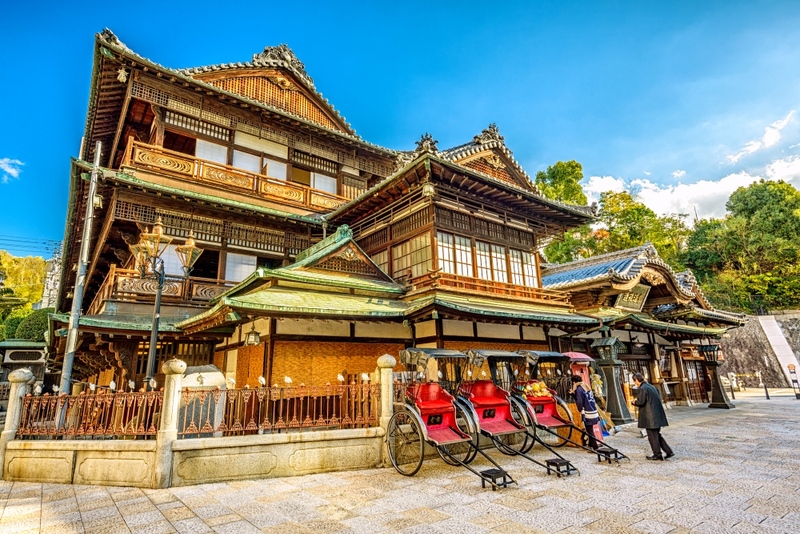 Historic Dogo Onsen in Matsuyama is a place of much needed rest and relaxation, after all the pilgrimage and sightseeing. As one of the oldest traditional onsens in Japan, Dogo Onsen’s history stretches back over 1,000 years. This mythical hot spring has been part of Japanese history and poetry, with many a famed visitor throughout its history, including a future Emperor, Prince Shotoku in around 574 A.D. The onsen is also famous for having inspired the bathhouse in the classic Japanese anime ‘Spirited Away’. This bathing house is so revered that there is a special room that is reserved exclusively for the Imperial Family. So if you’re looking for the royal treatment, this is the place to go. Ehime is among the only places in Japan to have a festival dedicated to fireflies, or Hirota, which are found in abundance for about two weeks in mid-June. The best places to visit are Ozu, Matsuno and Hirota Village, where the air is crisp, clear and pollution free. During the summer months, you can also look forward to Uwajima Gaiya Summer Festival, held in mid-July, and the Matsuyama Summer Festival, complete with weekly events held every Saturday through July and August, including its famous night market held in Okaido and Gintengai. The actual festival is held at the beginning of August and includes a dancing parade down Okaido in Matsuyama. The festival is capped off by a dazzling firework display from Mitsuhama Port. In October, you can also look forward to the three-day harvest festival or Niihama Taiko, complete with a parade of floats, as well as the Saijo Autumn Matsuri. The Saijo Matsuri, held in Saijo city, is a two-day festival that starts with 77 Danjiri lantern floats that are paraded through the city from 2 am to 6 am. The festival culminates at the banks of Kamo River, where floats are carried into the water with the twilight of dawn as a backdrop the following morning. Ehime Prefecture is famed for growing the best oranges in Japan, both mikan and blood organges. As a result their marmalade is definitely worth a taste. Ehime’s blood orange marmalade is a handmade specialty made from two kinds of blood oranges (moro and tarocco). The secret is an extra-long simmering process that serves to bring out the flavors and essential oils without disturbing their quality. While traveling through Japan, be sure to take some of Ehime’s famed yuzu oranges along with you. Even if you’re not looking to carry a sack of oranges on your travels, their taste alone may convince you otherwise. If not, try any of the yuzu-flavored products unique to the area, including yuzu soda pop, cookies, the prefecture’s signature tart (a sort of spiral cake with red bean paste infused with yuzu), and even gummies. Ehime is also famed for its marinated Japanese sea perch, which is served in Ehime’s most exclusive haut-cuisine spots and more recently through ANA’s first class meal service. The sea perch is accompanied with gently grated vegetables, edible flowers and a light orange-colored carrot yuzu sauce that serve to enhance the fish’s gentle qualities without deteriorating its taste. Aside from oranges, more practical gifts and delicacies that won’t grant you a stop at immigration include Ehime’s (above mentioned) blood orange marmalade, yuzu blood orange spiral cake, and a host of handicrafts unique to the area. Ehime’s well-known handicrafts include round Hime-Daruma dolls wrapped in silky crimson fabrics that also serve as fertility talismans. The doll was first created to commemorate Empress Jinko becoming pregnant with future Emperor Ōjin while visiting Dogo Onsen, around 200 A.D. (although surprisingly no certain dates have been established). Tobe porcelain, priced for its artistic work and cobalt blue color is a famed collectible that is worth the museum visit to Tobe (the small town that bares the porcelain’s name). Finally, Iyo Kasuri, one of three most prized Kasuri (or splashed pattern textiles) in Japan, gives Ehime its famed national status. The fabric is priced for its indigo blue hue, durable cotton strength and texture and is said to have inspired denim’s original hue and durability when first encountered by western fabric makers. Whether you’re looking for a traditional Japanese stay, a comfortable hotel to rest your head, or a luxury hotel with all the best in comfort, Ehime is equipped with all sorts of accommodations complete with distinctive Japanese hospitality. The Setouchi Retreat Aonagi (http://setouchi-aonagi.jp/en/) designed by Tadao Ando offers an exciting blend of minimalist Japanese architecture and superb hospitality. With a focus on indoor and outdoor spaces framed by the breathtaking natural setting; Ando’s singular vision works in tandem with nature without compromising luxury and comfort. Complete with private infinity pools and saunas that jet outwards onto the landscape, the Setouchi Retreat Aonagi stands apart as one of Ehime’s (and Japan’s) best lodging retreats. The Funaya Ehime (http://www.ryokan.or.jp/english/yado/main/71960) is a centrally located Ryokan that also boasts a 380-year history. Hot spring baths, Japanese gardens and saunas, and just 200m from Dogo-Onsen Train Station, the Funaya Ryokan is the perfect place to unwind and get the perfect Japanese style R&R. This is merely a simple taste of the unique offerings that Japan’s ‘lovely princess’ boasts; where the magic of a traditionally Japanese experience thrives. With so much to do, a visit to Ehime Prefecture can be as rewarding as the big and brash neon experience that some of Japan’s more visited cities inspire. Ehime is connected to the mainland of Honshu through the Shimanami Kaido bridge system, or by Shinkansen, direct from Tokyo Station, and JR train though the Akashi Kaikyo bridge via Awaji Island in neighboring Kagawa and Tokushima Prefectures. This is also the perfect route from Osaka’s nearby Kansai International Airport.